Are you just beginning your golf journey? Have you done your homework and found all the right clubs you need? Think again! A putter might be one of the most useful clubs in the golf bag. But the amount of time an average beginner in golf spends in choosing the right putter is probably the least. You know, a putter is more important in your golf sessions than you think! This is a club that is going to help you hit most of your strikes. So why not start with getting to know the most popular putters available on the market. When we call a putter one of the best, then it comes with a convenient grip, durable material and fit within your budget too. Here we have a list of the most forgiving putters on the market. This is specially designed for the male golfers and there is a slightly more convenient lighter version available for the female golfers. This is” one of the most popular putters mainly because of the variety of choices available to suit every player. The grip provided with the putter has so much impact on the way you hold the club. Some beginners grip the club too tight and this negatively impacts the shots. Thicker grips might be the answer for them. This is why this putter is available with a variety of grips to choose from. The standard size available for the men’s putters is 34”. The one thing we do not like is that white finish of the putter might come off easily especially at the club head. But using a head cover can help prevent this problem. This putter has always been popular for its unmatchable durability in the beginners’ putter segment. The white finish, as we mentioned, wears off easily. This doesn’t really impact the putter’s performance, it would leave it looking old. This is a putter that has been engineered to perfection with the smoothest and strongest design. The insert of the putter is something that the users love. It not just performs well but also sounds great for each shot. This is perfectly complemented by the mindfully designed club head design. The head shape could be varied based on the actual position where the shot is taken and the type of strike required. But one thing we are not very fond of is the weight of the club head that seems a bit too light. This putter comes as a “rounded heel-toe weighted” putter. There is a crank neck hosel in the design. This putter comes as an easy to use one. The weight is ideally balanced out to make it easy for the absolute beginners to handle it with confidence. The quality of the build is another plus that you would notice. During your early days, you might be practicing hard. These are also the days when your shots might be ill-balanced and inconsistent. The strength of this putter makes it a great option for your intense practice sessions. There are not many options when it comes to choosing the shaft length. Also, the variety in terms of the putter grips is less. The lightness of the putter, on the whole, can make it tough to gain control over. There are many putters available on the market for left and right handed players separately. But there are very few that come as a convenient two-way putter. This is one such rare putter. Even those who are ambidextrous would find this a convenient choice. It is not just the design that excels but also the grip. Every element of the design is intuitively crafted to allow handling in both the ways. This comes as a 33.5” long putter that weighs 12.08oz. This makes it a perfect choice for an average beginner. One thing that comes as a big turn off is that this one doesn’t come with a choice of shaft lengths. This is one of the most affordable putters available for the beginners. The two-way design also helps in delivering perfect symmetry and thus well-balanced swing. Those who find offset heads difficult to master might find this one easier to use. The M1 putter from Wilson comes with a design that offers easy alignment of the club for the beginners. One innovative addition in the design is the inclusion of the horizontal lines on the head of the putter. These lines help golfers to align the putter head during the strike. The grip of the putter is something that is worth a special mention here. It is a reasonably thick grip that is perfect for the beginners. The thickness prevents the golfer from curling his fingers around and unintentionally tightening the grip. The vertical seam added at the back enhances the grip a great deal and this can be felt at each stroke. Another aspect of the design that stands out the insert of the face. The “micro-injection polymer” face makes this putter feel great at the time of the impact. Though the design, on the whole, is pretty convenient there are few things we do not like very much about this product. For starters, the grip is good but there is not option to choose a different one. The pricing of the product is something that gives it an edge over its competitors. Talking about the build, this putter helps strike accurate shots every time. The paddle grip comes as a durable one that can withstand every weather condition. Though the putter might feel great on the whole, the putter head might feel a bit loose for some. You do not have the freedom to choose the shaft length. So for the tall and short golfers, this might be a tough choice. This one is a winner in terms of its design and first look. The progressive mallet and the White Hot insert are things that mention a special mention here. There is a 2-ball alignment on the club head. The great roll that the putter delivers is something you would notice the moment you use it. This makes it one of the best clubs out there to take your shots on the putts. The roll is found to be better in every aspect including the speed. The White Hot insert offers a unique feel and this is blended well into the build of this putter. The soft core of the putter is responsible for the lighter feel and the speed of the shots. Here is another one from Odyssey on our list. The brand is popular for its White Hot Insert which has been popular for the ultimate golf club feel it offers. The White Hot insert in this comes as a refined version of the usual finish that occurs in other Odyssey clubs. The insert cutting process is precisely done with laser. This one is available in different shaft sizes. So you could pick one that perfectly fits your grip position. One other thing that you would notice about the styling is the slick gunmetal finish. This PVD finish gives an elegant look to this club and also improves the durability as it doesn’t get scratches very easily. On some of the models in this club, you would be able to find weighting system that could be modified. The head shapes are intuitively designed to offer the best impact for every stroke. We love almost everything about this putter but the pricing can be a discouraging factor for some golfers. These are tested Tour models that would never let you down. This means that in your learning days this would go a long way as an ideal training companion. The gun metal finish doesn’t just make the club look great but also makes this putter feel nice when you hold. You would also notice the finesse in the sound and grip when you hold the putter. The grips provided blend perfectly with the shaft to create the perfect streamlined design that can cut through the air for a great shot. Odyssey clubs have always boasted of the best in class quality. This is mainly because of the manufacturer’s emphasis on stringent testing processes. Design tweaks are continuously incorporated after testing and feedback from the best players on the field. The gun metal finish does withstand scratches a great deal. But the club head is something that wears off easily. It would be a better choice to use the club head cover included in the package. Wide head putters have a charm of their own. The comfort of striking with these make these famous with the beginners. The broader club head allows a larger surface for the impact. 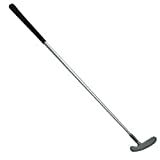 Here is one such putter for beginners which comes with a broad head and a balanced shaft. The white finish improves the visibility on a grass field. But the paint job looks a bit cheap and tends to wear off soon. But the matte look reduces glare. This is something that disappointed us. This one looks very much like the popular Ghost putter but doesn’t parallel its superior construction. But this is an easy to handle club that also lasts pretty long. This makes it a great investment. This club is great to hold and you would be able to balance the shots pretty well. The broad mallet has been shaped so that beginners can avoid mis-hits. For a great forward spin and for a smooth roll of the golf ball, the club comes with a “PureRollSurlyn” face insert. For perfectly framing the ball when you are new on the field, the alignment lines come in handy. This can help fine tune your aim without much trouble. The brand’s Motion Analysis Technology by TaylorMade is included in the putter to improve the precision of the shots by perfectly balancing the putter. You do not have the choice to pick a lot of grips. But you could always buy one separately and regrip it yourself based on your gripping style. Here is a putter that is designed to perfection. Right from the shape of the mallet to the insert every element of the design has been done to perfectly help beginners get the right roll and the perfect swing. Two parallel lines run from the middle of the club face. These lines make it easy for you to frame your shot before actually taking a hit. And for instantly correcting the position there are two perpendicular lines as well. To improve the moment of inertia, the putter comes with a high MOI design. This is incorporated in the club head that also enhances the overall feel. And for all those hits you make off-center this high MOI design would ensure that there is no loss in the distance. The length of the shafts are available in different options from 33” to 35” to suit different stroke lengths. Whether you are looking for heel-shafted or center-shafted models, you would find them both. The RollCopolymer face insert gives that soft roll and feel while you are at the putt. It is also consistent with every shot as you would easily be able to analyze and predict the roll. The handling of the putter feels simpler and this allows accurate shots at the putt. If you are looking for a non-blade putter this is one of the best out there. The club head improves the impact and helps beginners work on their accuracy before trying out blade putters. The off-center shots give a good distance due to the high MOI design but the balance in such shots might seem a bit loose. Though we now have a lot of broad club head putters for the beginner's blade putters have still not lost their charm. These are great simply because these are long-term investments. If you purchase the best blade putter like this one we are talking about, you could use them during your training days and later too. The brass blade head comes with a chic finish all packed in an affordable price segment as well. Use it on the greens to hear that elegant sound of the steel shaft and the brass blade cutting through every time you swing. This would cause the perfect roll without the slightest deviation in your precision. The blade comes with a smooth finish that also has a slight friction to perfectly give that extra distance to your rolls. The brass head is not just about the looks but also known for its tough and scratch resistant nature. This means that your club would stay as good as new for a long time. The steel shaft of the club is pretty lightweight. The club head is perfectly balanced on the lightweight shaft to give the right balance in your stroke. Talk about the durability, to complement it comes the all-weather grip that doesn’t wear off soon. For someone who has never used a putter before, this one is a great club to start with. The pricing of the putter is another attractive factor especially for the first timers who do not want to splurge on their first putter. This is a heavy contender even for those pricey ones you would find on the market. We find a lot of putters these days with proprietary insert designs to improve the roll. But this one doesn’t come with any fancy features. But this is a no-fuss easy to use classic that you could hold on to for long. Here is another broad club head putter perfect for the beginners. The club head is not just broad but is uniquely designed with a 2-ball Versa technology design. This makes it easy to work on the accuracy. Versa alignment designs with their contrast have always been popular. This makes it one of the best Tour proven putters you can get for a beginner putter. The alignment line provided on the club helps golfers to perfectly align the club at every shot. The head is also surprisingly well balanced and easy to take control over as a learner. The design of the shaft is great especially with the backswing and the forward swing ease that the golfer would notice. If you are looking to make a Super stroke this one is a great choice. But you might find this a bit difficult to master. However, all your basic shots on the putt would be pretty simple with this one. 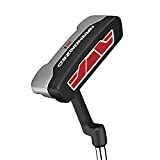 Odyssey Golf Men's Lined Versa with Superstroke Grip Works 2-Ball Fang Tank Putter, Right Hand, Steel, 35"
1. Weight of the club: The overall dimensions of the putter and the putter head would matter a lot. But equally important is the weight of the putter. The weight of the putter influences the swing. Lightweight putters might be easy to handle as a beginner but these would offer very little control on your shots. And a heavy one might make it difficult to give the shot more power. To improve the accuracy of your shots, choose the ideal weight putter. This would also depend on the size of the putter you choose. For example, a 34” putter’s head can ideally weigh around 350-360g. 2. Length of shaft: This is the first attribute considered while purchasing a putter. The length of the shaft of the putter determines the position of the club. This also determines the position of the club head when the impact it made. Your overall body posture would also be adjusted so as to accommodate the length of the putter and get the right strike. A standard putter is an easy choice. But if you find your grip move down the shaft on a standard putter you might then need to choose something a little shorter. 3. Putter lie angle: To pick the best putter lie angle as a beginner it would be best to seek the help of a club fitter. This would ensure that your putter lies at the perfect angle during the impact. This is important to deliver the perfect distance and angle to the shots. 4. Does it balance well? Combined effects of the weight and the length of the putter would determine the kind of balance you get with it. To find the perfect balance you would also have to familiarize yourself with the kind of strokes you deliver. The most common balances when it comes to choosing the putters is toe-hang or toe-balanced and face balanced. 5. Understand your stroke: It takes some time on the greens to get to understand your stroke. All such guides to help you pick the right putter would only help you understand the theory behind the clubs. It would be good to know the mechanics of the club. But knowing your style would make sure you choose the perfect one. One good option is to simply try out all available putters from the golf club you practice at. Get the advice of a good club fitter to help you make a decision. Then you could perhaps choose a low priced club to start with if you still don’t know your stroke. But once you understand your style, you would be able to pick a suitable putter easily. This would also help you understand whether you need a blade putter or a broad head putter. Then you could purchase a high-quality expensive putter that can last for years. No matter how much research you might have done it would always be a hard to comprehend idea to understand putters or any golf clubs for that matter. For the first timers especially it would be a wise idea to try the putters before buying them. After stringently weighing each of the choices available we shortlisted those putters that are the best for the beginners. The best part is that most of the putters on our list are also available in other variants to suit experienced golfers. This can make the transition easier too. Consider the face of the club and the loft angle for fine tuning your choice. A durable putter would go a long way in your early golfing days. So, good luck picking your first putter!